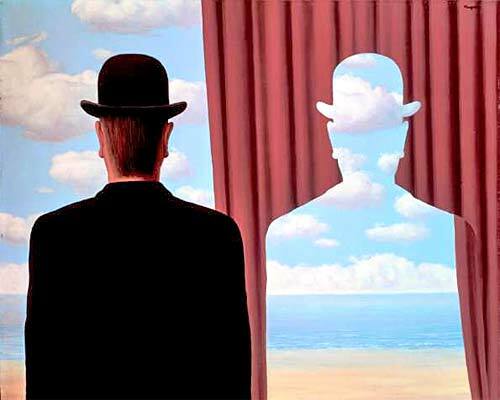 A big new retrospective of the work of surrealist René Magritte will open at the Los Angeles County Museum of Art's Anderson Building next Sunday. But it won't be just any Magritte show. The installation for "Magritte and Contemporary Art: the Treachery of Images" was designed by artist John Baldessari. "The entrance will re-create 'The Unexpected Answer,' a Magritte painting of a door with a cutout silhouette of a ghostly figure," notes the L.A. Times. "Visitors will walk through the open silhouette into galleries carpeted with a woven version of a Magritte-style blue sky with fluffy white clouds. The ceiling, where the sky should be, will be papered with images of freeway intersections. A big square window will be covered with a transparency of the New York skyline. The guards will wear derby hats." The show features 65 paintings by Magritte and 65 works by 31 different modern and postmodern artists whose work was influenced by Magritte. Posted by: MIKE JOHNSTON with a tip o' the hat to D.E. Attended the Margritte exhibit some years back at the Met- and that was pretty amazing in and of itself. This show sounds like they're doing the master in a manner he would most approve! Thanks for the heads up. I will be in Los Angeles for the Thanksgiving week and I do normally check out the LACM, but now I know to buy tickets a head of time - 1PM Friday. Should be fun. I had fun at this exhibit. Magritte's paintings haunted my childhood, and it was great to finally see them in person. Excellent presentation! William, be sure to check out the re-opened Griffith Observatory as well.